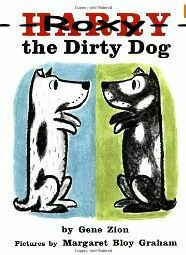 In the mornings while we sniff pee-mail and investigate other interesting stuff. SHE likes to look at flowers. 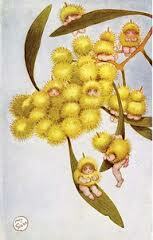 The gum trees are flowering now. And there are loads of gumnuts. 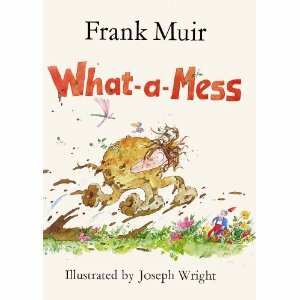 This reminds HER of May Gibbs. 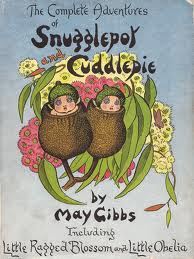 May Gibbs was born in England and came to Australia as a young child. She fell in love with the bush and its flowers. 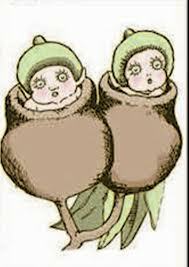 She used the flowers and gumnuts in the many stories she wrote and illustrated later. 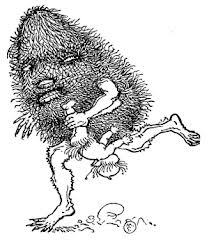 became the villains....the Big Bad Banksia men. May Gibbs' stories were published in the early 1900s and the characters have become part of Australian culture. 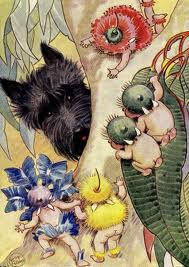 We like May Gibbs because she had a scottie! This morning, after our business walk and run in the park, we went into town. George the Lad's birthday post. 7 a.m. and Sunday, so the street was OURS! There's a big, blue Vacula on the other side of the street. Then SHE went into the Breadshop and we waited in the car. Roxy and I like looking out the window. But Bella always sits on the floor behind the passenger seat. When we got home SHE checked out George's blog to see where to send our picture. 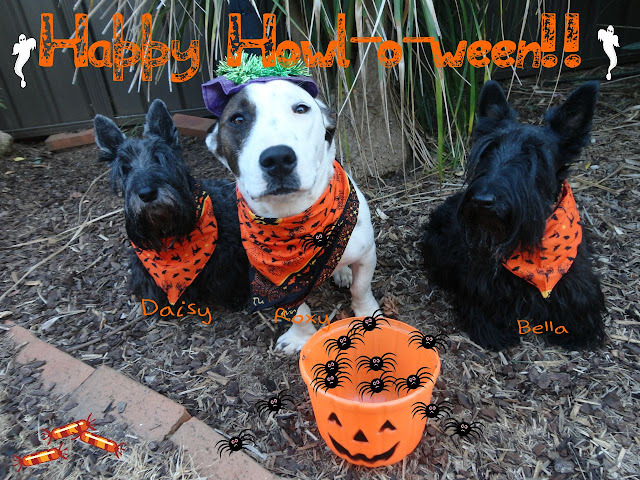 Turns out we didn't need a picture of us on steps.....just a picture of US! BOL! A teacher who doesn't READ the directions!!! Do you remember last year when Roxy modified her sandals by chewing the middle strap of one shoe? SHE removed the middle strap of the other sandal, and continued wearing them. Last night, Roxy chewed off another strap.....but this time, they can't be revived. Roxy has only chewed shoes while SHE's taking a bath. She doesn't do any damage when left alone. all curled up, trying to be invisible. Last night she chewed up HER expensive favourite shoes. She chewed the heel out of them. SHE said SHE was going to sell Roxy on e-bay! But, I told Roxy not to worry because SHE was going to sell ME last week, when I knocked the sliding door off its rollers... again. Just after SHE paid someone to repair it! I have lived in this house with HER for 9 years, 5 months and 12 days! I have lived here 6 years longer than Bella and 8 years longer than Roxy. You'd think SHE would know by now! I'm just sayin'. 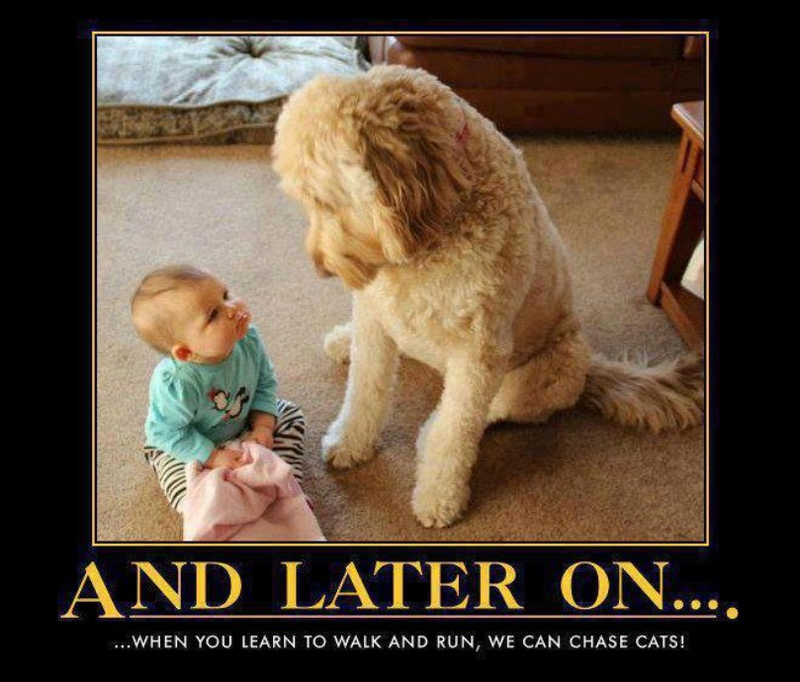 Do your humans run through everydog's name until they get to yours? They've dug fox holes all over the yard! These are samples because the holes don't come out very well on the camera.